Should You Buy a LCD, DLP or LCoS Projector? Looking for a projector so that you can watch the Super Bowl larger than life? Are you confused by the projection technologies that are in competition? Should you buy a projector that uses DLP, LCD, or LCoS? Well, let’s try to figure this out. The oldest projection technology is LCD. LCD projection was introduced in 1984. I was in the business back then. Prior to LCD, the method of movie projection was simple. Each frame of the film—usually 35mm at the movies and 16mm at home— was a tiny, translucent photograph. The film was run through a projector at the rate of 24 frames per second, while projecting light through the film and an imaging lens. The images would then be projected onto a large screen. In the early 90s, we had black and white LCD panels that were placed on an overhead projector. In the mid-90s, color panels came into existence followed by a LCD panel built into an overhead projector, making a one-piece projector. Shortly after that, a true projector was introduced. Since then, we have seen many improvements from the projection technology to the many features available today, including 4K resolution. After 35 years, LCD technology is still very popular, but LCD projectors work a little differently than the panel/overhead projector system. A beam of high-intensity light travels through thousands of shifting pixels in an LCD display instead of through a frame of translucent film. Initially, there was just one LCD panel, but Epson improved on that by introducing three panels, and this technology is called 3LCD. The light splits into three hues, then travels through three LCDs before recombining in a prism to generate the crisp, colorful image projected on the screen. 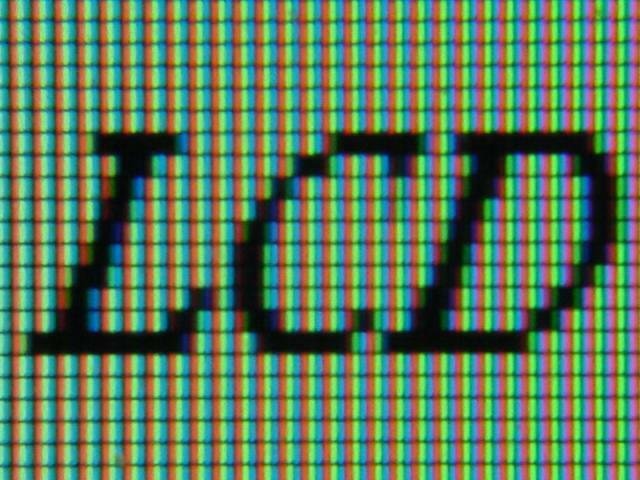 If you get close to an LCD image, you can see small squares or pixels. Each one of these is effectively a separate red, blue, or green light that can be switched on or off very rapidly to make a moving color picture. In an LCD projector, the pixels are switched on or off electronically using liquid crystals to rotate polarized light. 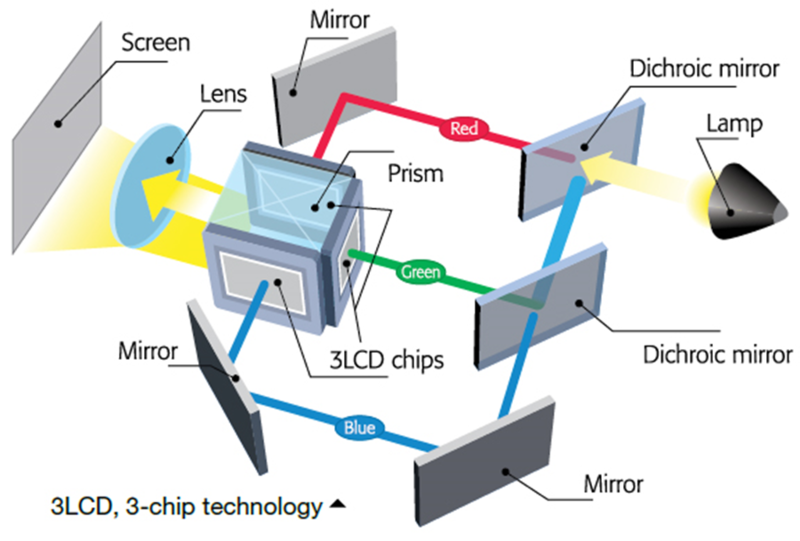 3LCD projectors use 3 chips in every projector. The 3-chip design delivers vibrant, true-to-life images with up to 3 times higher color brightness, and 3LCD requires 25% less electricity per lumen of brightness compared to the 1-chip projectors. 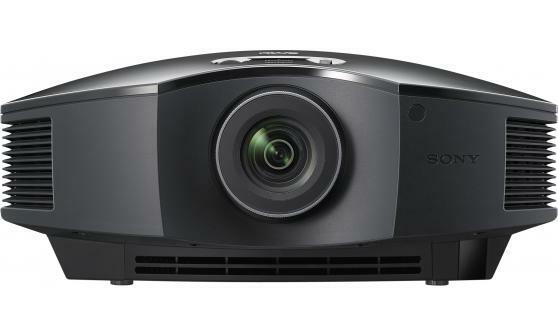 One of the best 3LCD home projectors is the Epson 5040UB. The 5040UB supports 4K streaming devices and Ultra HD Blu-ray content, and is compatible with High Dynamic Range (HDR) content, displaying deep, dramatic blacks. It delivers 2,500 lumens of color brightness. It has 1,000,000:1 dynamic contrast ratio ensuring rich detail in both bright and dark scenes. DLP came on the scene in 1997. It was invented by Texas Instruments. In DLP projectors, the image is created by microscopically small mirrors laid out in a matrix on a semiconductor chip, known as a Digital Micromirror Device (DMD). Each mirror represents one or more pixels in the projected image. The number of mirrors corresponds to the resolution of the projected image. Rapidly toggling the mirror between two orientations (on and off) produces gray scales, controlled by the ratio of on-time to off-time. Just like LCD, DLP started with one chip and now are using 3 chips. 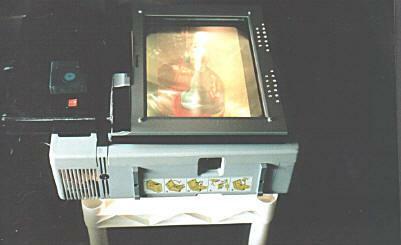 A 3-chip DLP projector uses a prism to split light from the lamp. Then, each primary color of light is then routed to its own DLP chip, then recombined and routed out through the lens. Three chip systems are found in higher-end home theater projectors, large venue projectors and DLP Cinema projection systems found in digital movie theaters. The three-chip projectors used in movie theaters can produce 35 trillion colors. The human eye can detect around 16 million colors, which is possible with the single chip solution. In contrast, the 1-chip DLP projectors have the advantage of allowing any number of primary colors in a sufficiently fast color filter wheel, and so the possibility of improved color range is available. If you decide on DLP as the technology that you want, check out the Optoma GT5500 with super-sized 100-inch images from less than 13 inches away. This is a full 1080p projector with high brightness and low latency. An integrated speaker provides great sound and two HDMI inputs enables an easy setup. You can even turn it into a smart projector by connecting a HDMI dongle like the HDCast Pro, Google Chromecast™ or Apple TV™ to play games, stream videos and share photos on the big screen in the comfort of your own home. Liquid crystal on silicon (LCoS) is a miniaturized reflective active matrix LCD, using a liquid crystal layer on top of a silicon backplane. In a LCoS display, a CMOS chip controls the voltage on square reflective aluminum electrodes buried just below the chip surface, each controlling one pixel. For example, a chip with XGA resolution will have 1024×768 plates, each with an independently addressable voltage. There are two categories of LCoS displays just as with LCD and DLP—three-panel and single-panel. In three-panel designs, there is one display chip per color, and the images are combined optically. With LCos the lamp creates a beam of white light, which passes through a condenser lens that focuses and directs the light. The white light is separated into red, green and blue. The beam passes through a series of dichroic mirrors that reflect some wavelengths while allowing the rest of the light to pass through. For example, the dichroic mirror can separate red light from the white light, leaving blue and green, and a second mirror can separate the green light, leaving only blue. 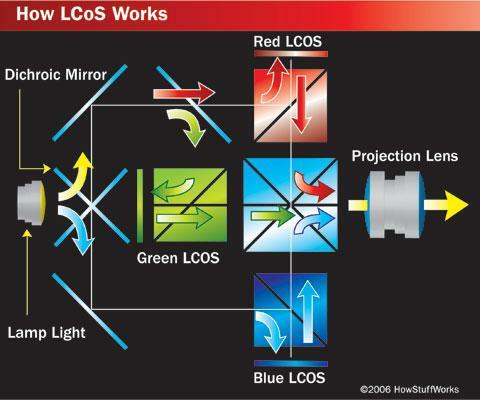 The created beams of colored light simultaneously encounter one of three LCoS microdevices—one each for red, green and blue and the reflected light from the microdevices passes through a prism that combines the light into a projection lens, which magnifies the image and displays it on the screen. The next projector that you should check out is the Sony HW55ES, which is a 1080p dedicated home theater projector with 3 LCoS panels. The VPL-HW55ES projector has a manual zoom lens, and a good deal of lens shift. It has 120,000:1 contrast range. The exceptional picture quality has natural skin tones, extremely good black level performance, and an exceptionally bright calibrated picture. We hear about LED projectors, but actually LED is a light technology. Some DLP projectors with “solid-state illumination” technology are actually LED projectors. 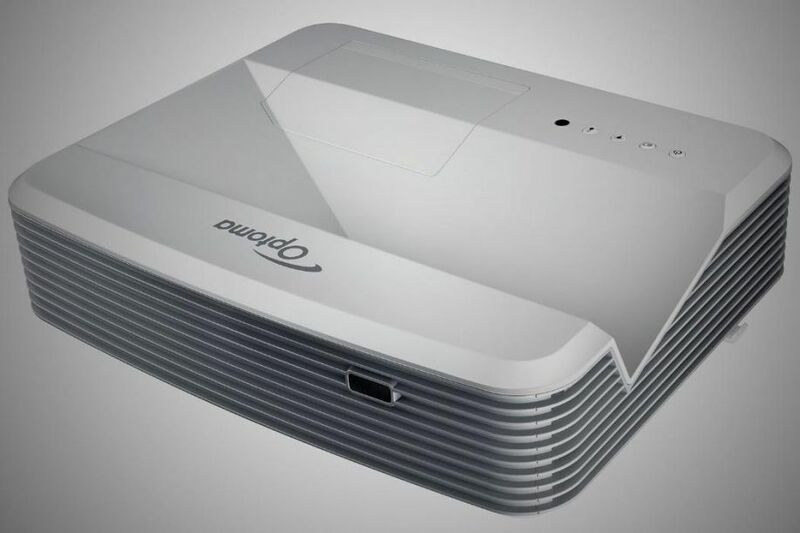 Another type of projector, the pico projector, commonly uses LED technology as well. 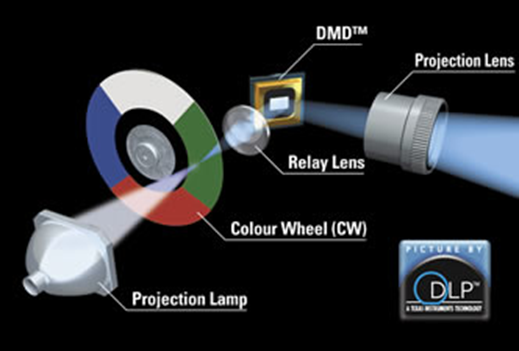 Pico projectors are essentially handheld devices that use LCoS. In these cases, the projector replaces the traditional lamp with long-lasting and more efficient LEDs, colored in red, green, and blue. In DLP projectors, LED replaces the color wheel technology, instead letting the red, blue, and green LEDs shine directly on the DMD chip. The LEDs in an LED projector have a much longer life than traditional projector lamps, rated at 10,000 or even 20,000 hours as opposed to 1,000 hours to 5,000 hours. Because of this the LED light source is meant to last the entire life of the projector without needing to be replaced. This is a big advantage as replacing traditional lamps can be a major expense in projector maintenance. There is no warm-up or cool-down time needed because the LEDs are much more energy-efficient than traditional light sources, and they are also much quieter. The PF1000U from LG is a DLP projector that utilizes LED lighting technology, which gives a cinematic viewing experience with up to a 100-inch picture in clear Full HD 1080p picture quality. The PF1000U’s LED light source displays natural and rich colors and will last up to an estimated 30,000 hours or ten years, using the projector eight hours a day. It has an ultra-short throw lens and can be placed on any flat surface. No need for a ceiling mount. Now that we know a little about the operating technologies used in projectors, how do they compare? While I’m thinking about it, Sony calls LCoS SXRD, JVC uses D-iLA, and Canon calls theirs Aisys. In my opinion, LCoS technology is perhaps the best of the three technologies in the under $10,000 home theater projector market. Single chip DLP projectors can be small projectors, whereas LCoS and 3LCD require a larger case. DLP projectors have a sealed light path. Therefore, dust cannot get into the system to coat the DLP chip, or other surfaces in the light path. This is also true for most LCoS projectors while 3LCD panels are not sealed, allowing transient air to deposit dust on the panels. Although it is not normally a problem, dust could block the light. This is a warranty issue. Right now, none of the technologies can produce true black, which is the desired goal for home theater projectors. DLP has the advantage here, being the closest to true black. At one time, a high contrast ratio was the guide used. That is no longer true. Because of dynamic irises, the numbers are misleading enough as to be pretty much worthless. Generally, the 3LCD projectors are the quietest, but there are exceptions. The Epson Cinema series home theater projectors are rather noisy in high lamp brightness mode, although not quite as loud as the average DLP. Look for a projector that is around 28db to 31db with lamp on bright. After all of this, my recommendation is to watch a movie using each projector that you are considering. After all, each of us is divergent and see the screen images in a different way. 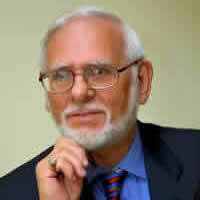 Len contributes to this publication on a regular basis.